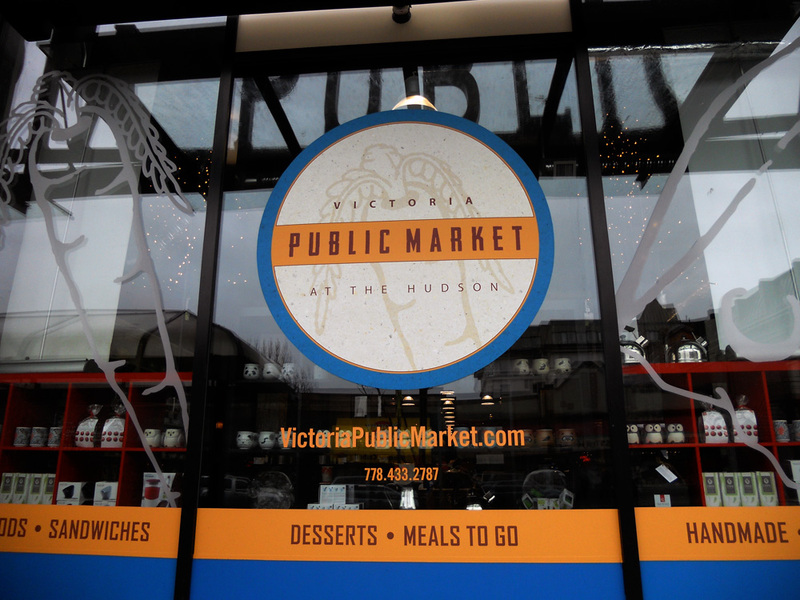 Late last summer, the Victoria Public Market at the Hudson opened in Victoria, BC Canada. 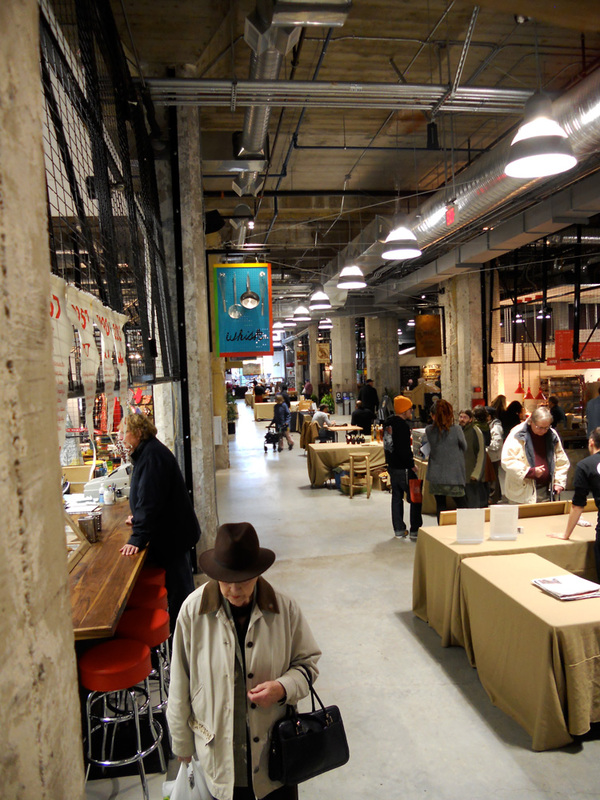 Now, most of the spaces are filled and it is alive with restaurants, farmers, fish and meat vendors, bakeries, and more. 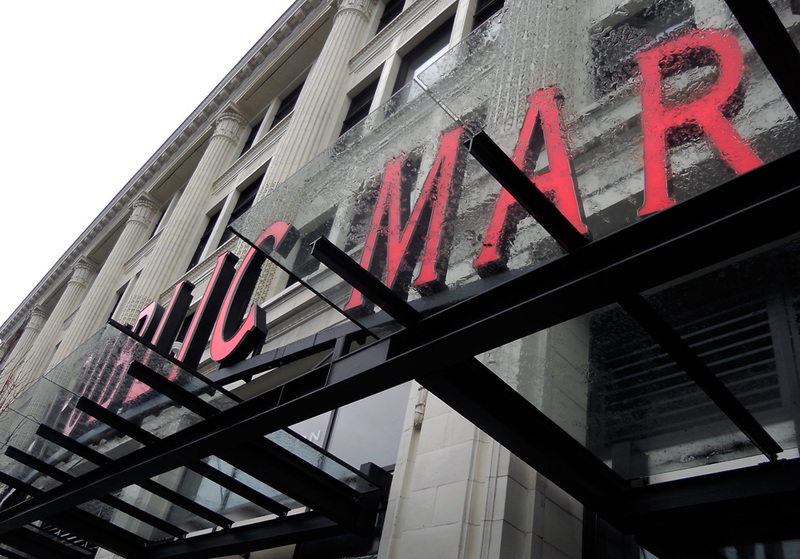 On a grey day, or any day, the Victoria Public Market is an inviting place (especially if you are hungry!). Douglas Street between Fisgard and Herald streets. 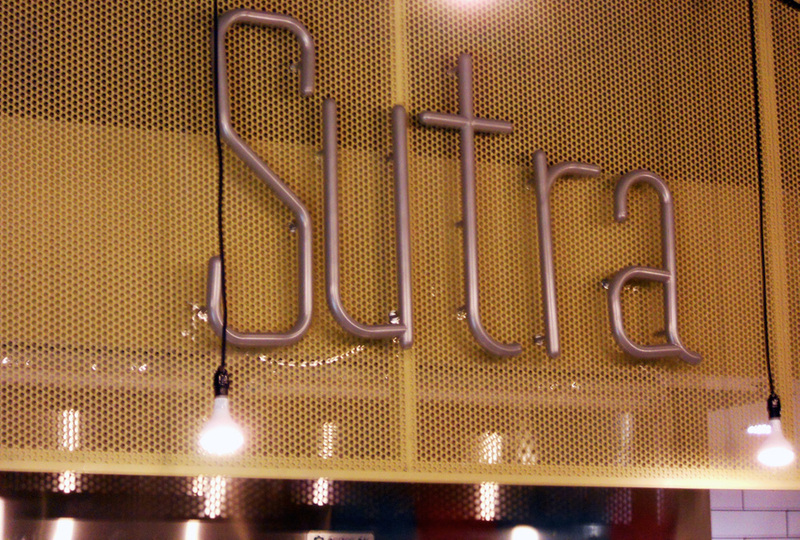 Elegant decor and attention to detail add to the delicious food at Sutra. 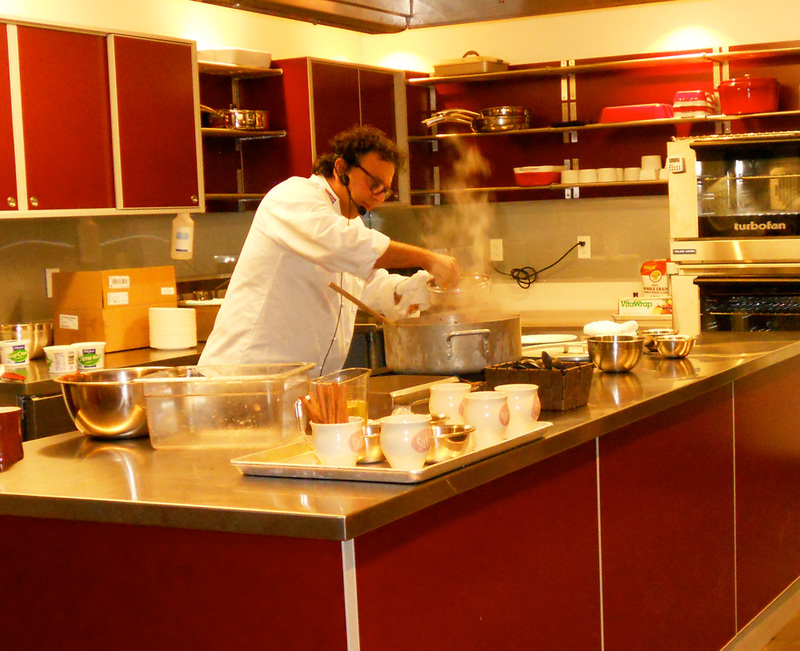 Vikram Vij from Vij’s in Vancouver cooks Vij Family’s Chicken Curry in the community kitchen at the Victoria Public Market. The aroma was intoxicating. 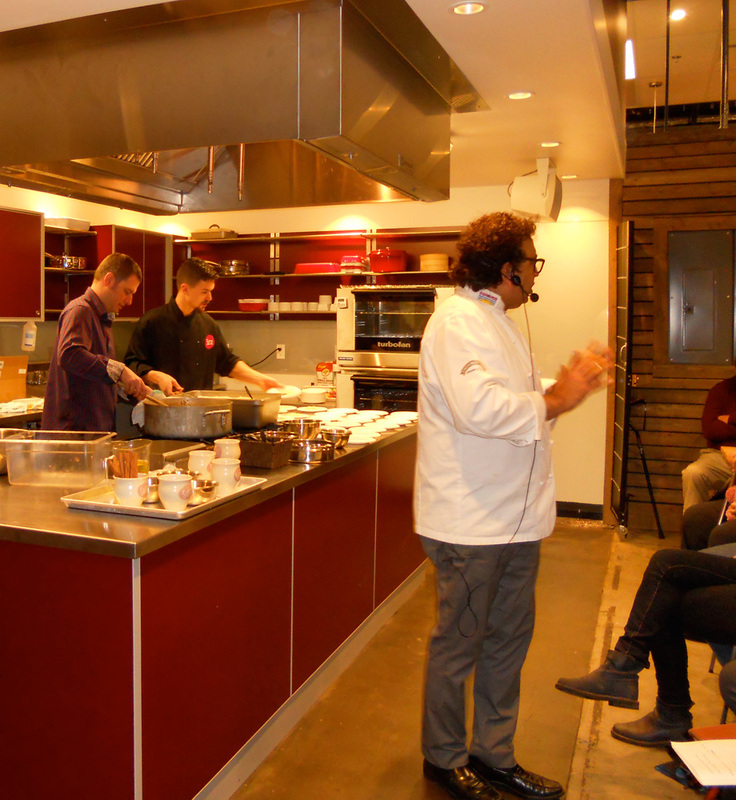 Sutra’s owner and chef dish up the curry while Mr Vij answers questions. 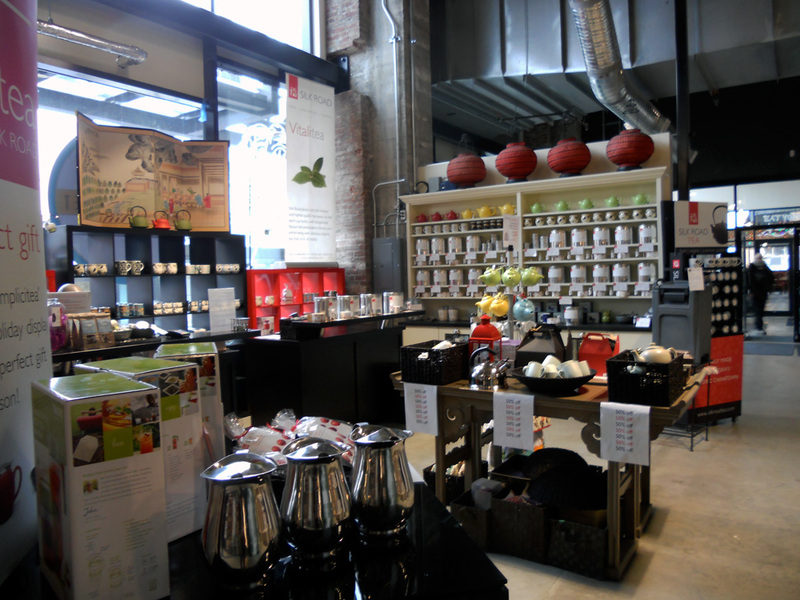 Silk Road Tea‘s satellite shop is located at the Public Market. Salt Spring Island Cheese is the first shop as you enter the Market from Douglas Street. 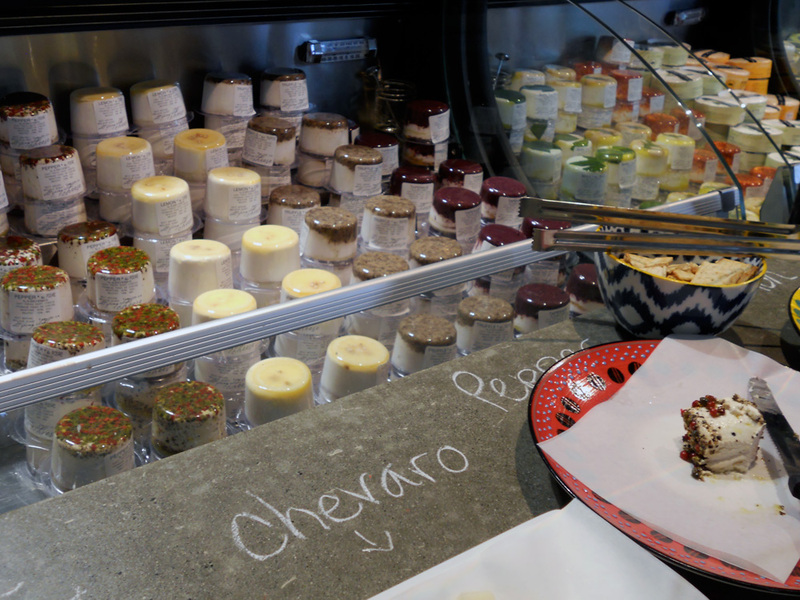 Tempting samples of their delicious cheeses are on offer daily. 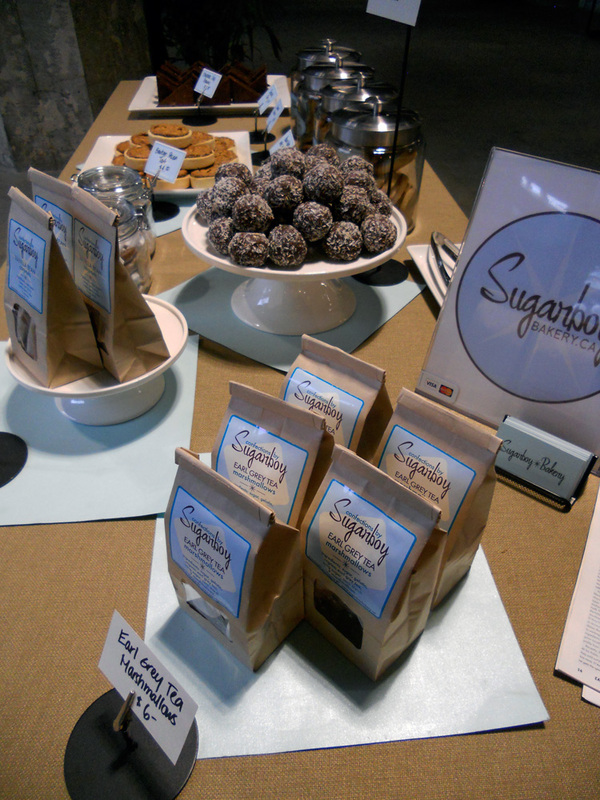 Sugarboy Bakery is a regular fixture on Wednesdays, Saturdays and Sundays. Yesterday we tried the Bourbon Pecan Tarts, which were heavenly. 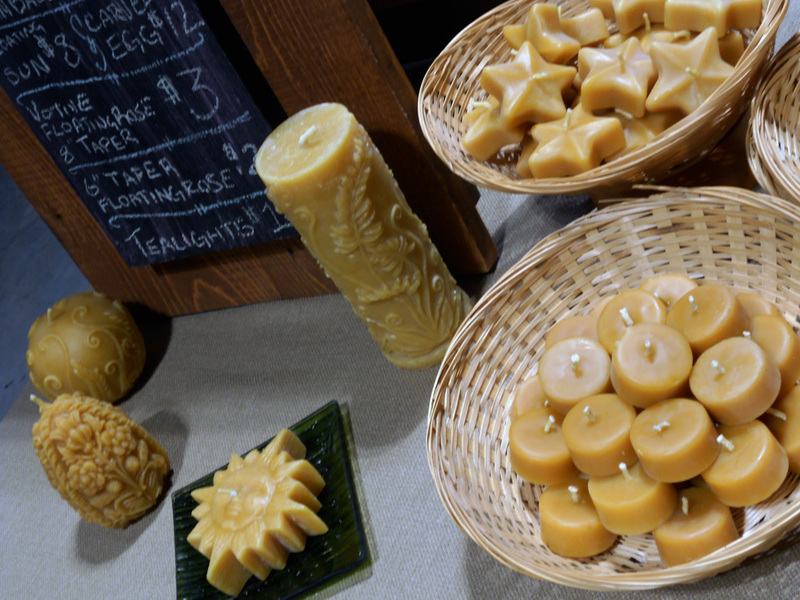 Cottlestone Apiary was at the Market yesterday with honey and beeswax candles. Damn Fine Cake Company, a very pretty space. 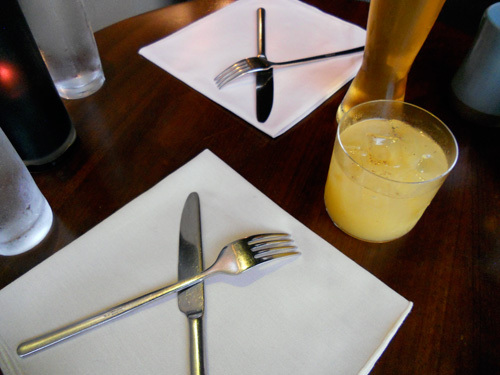 We look forward to siting down for a treat and beverage soon. 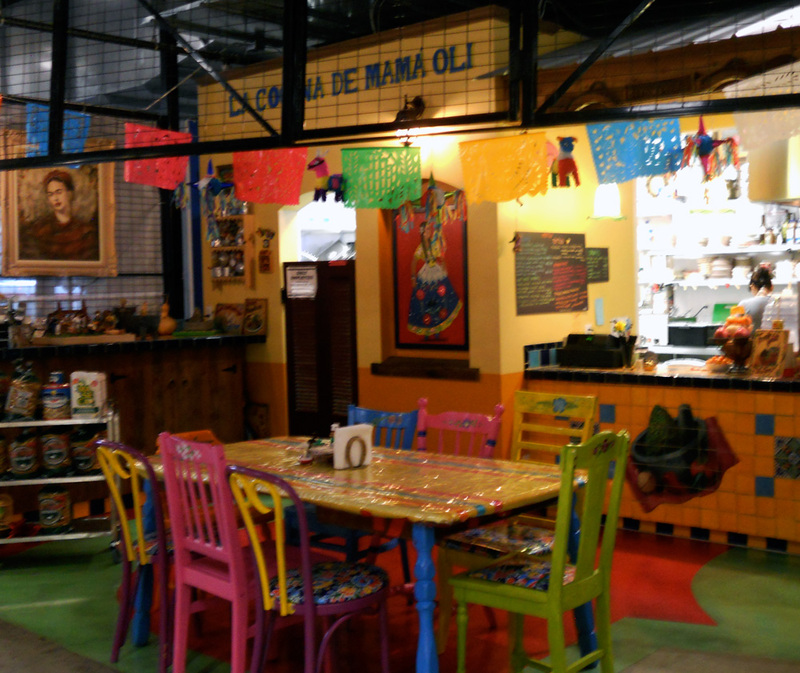 Newly opened, yummy Mexican food at La Cocina de mama Oli. 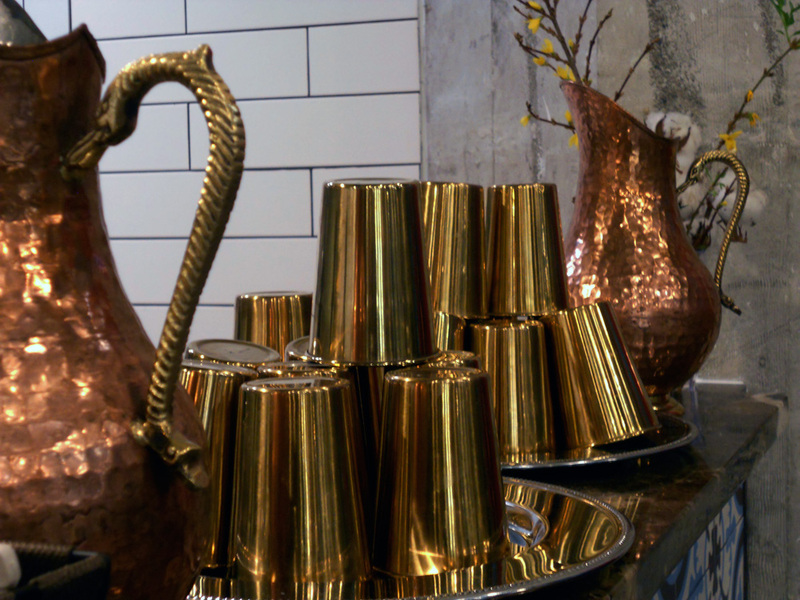 A very nice kitchen shop has just opened. 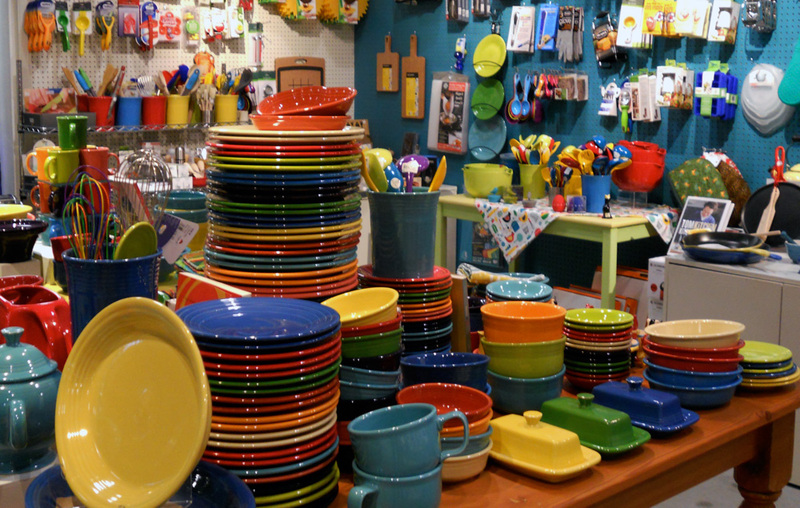 Colourful and abundant Fiestaware is a prominent offering. 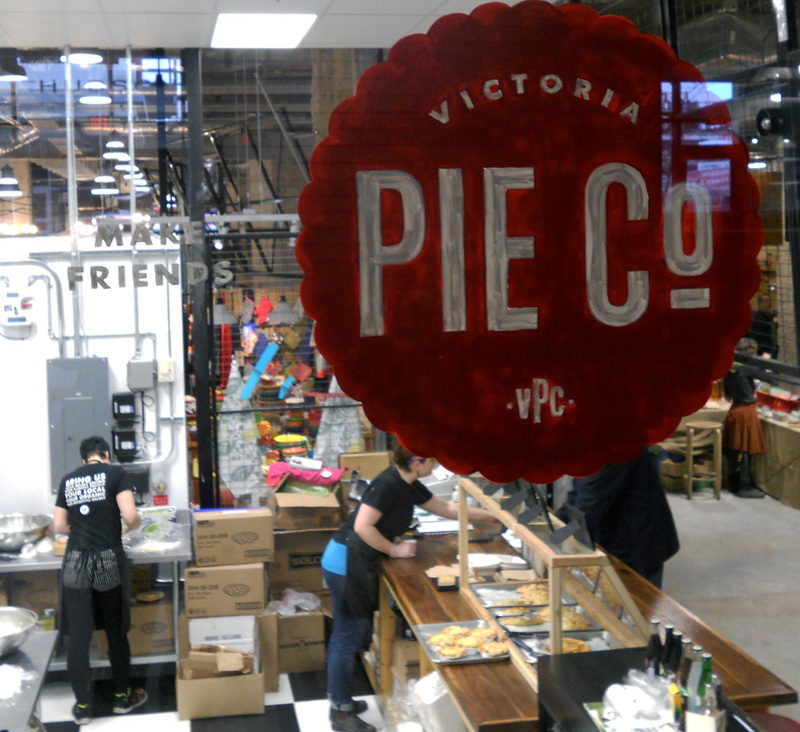 We haven’t tried pie from Victoria Pie Co. yet, but it sure looks great! 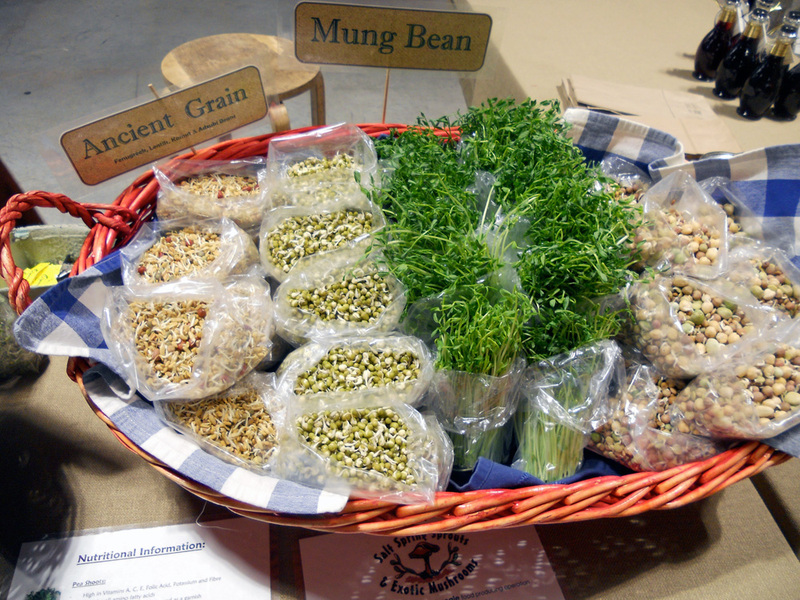 Salt Spring Sprouts & Mushrooms had some delectable sprouts and Shiitake mushrooms yesterday. Long shot of the Market. Left Victoria this morning for a few days in Vancouver, visiting friends and taking in a Cirque du Soleil show called Amaluna. Bright clear day in Victoria and gorgeous stormy day in Vancouver. 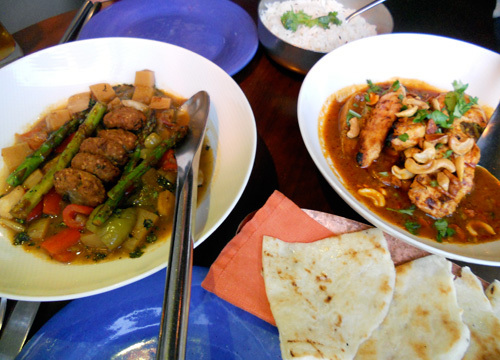 We enjoyed poking around on Granville Island, especially at Circle Craft, and had another amazing meal at our favourite: Vij’s. Also a great visit with a friend who has just started a new life in the big city. We’re proud of you LJS! Burr, chilly wait for the bus this morning, but so clear and beautiful! The festive lights at Granville Island. As per our usual Vancouver trip routine, after checking in at our favourite hotel, The Sylvia, we head out to walk the waterfront on English Bay. A quick water taxi hop over to Granville Island and then walk up South Granville investigating the newest shows at art galleries and poking around our favourite shops. I usually try on about 2 dozen items at Anthropologie and GJ helps me choose which ones look best! Then we walk down to Vij’s to line up for the first sitting at 5:30. I think this time we were there at 4:45! Luckily the rain held off mostly and being first in line we were able to stay dry. Our meal, as usual, was superb. I’ve been branching out a little to eat a bit of meat again, especially when we travel. I try to eat only organic ethically raised meat. Mr Vij seems to care greatly about his product and his guests so I feel pretty Ok about eating a bit of meat there, altho there are lots of vegetarian choices. We started with the Samosas. 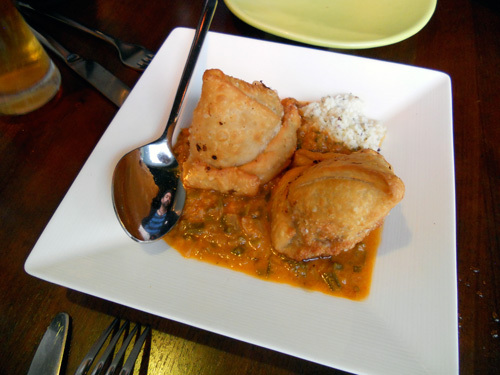 We don’t usually have a starter, but these were amazing: Samosas filled with lamb and beef sauteed in fennel, cloves and sumac. Incredible flavours and the coconut raita-like concoction on the side was delicious. For mains we split the Split pea and spinach mash and spicy millet/bulghar dumplings with vegetables sautéed in pomegranate curry and the Lemon-ghee marinated and grilled organic chicken breast and thigh in tangy tomato curry with roasted garlic and cashews. For dessert I always like the Kheer. We really didn’t need dessert and GJ only helped out with a couple spoonfuls. But it is a delicious, light finish to all the intense flavours of the meal. And the best treat was that Mr. Vij was there that evening. Such a perfect host. 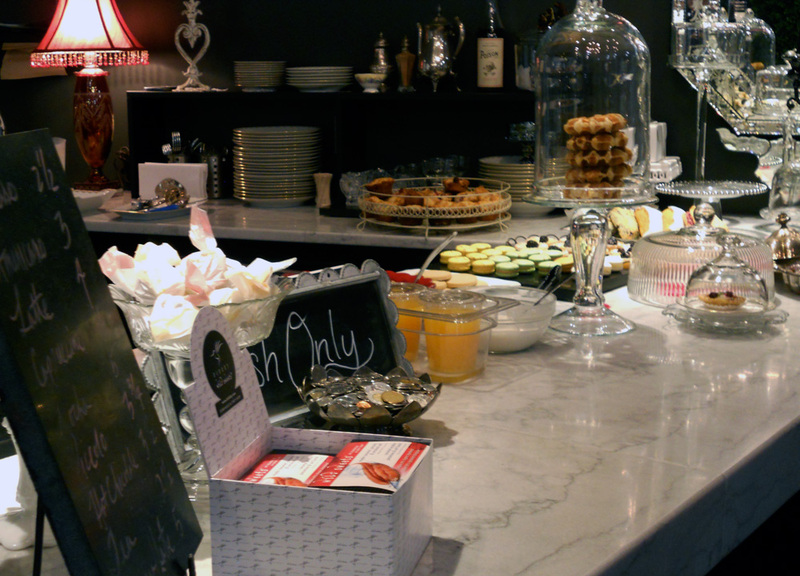 Great food, impeccable service, beautiful surroundings: we highly recommend eating here if you are in Vancouver. 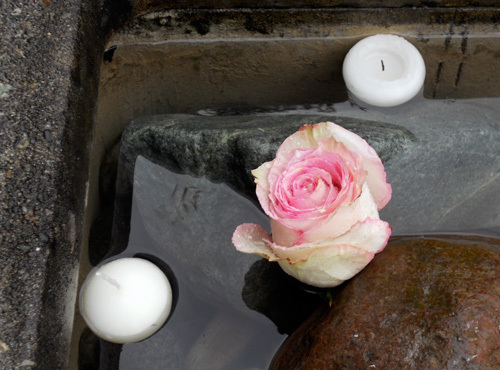 The water garden planters outside always contain floating candles and flowers. Really lovely when it’s dark out. 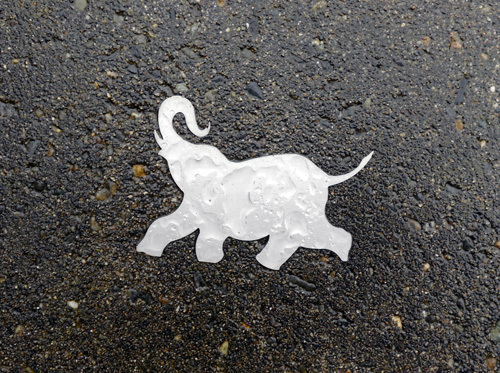 Vij’s logo, this running elephant, appears here and there. This one is on the edge of the concrete water garden outside on the entrance patio. 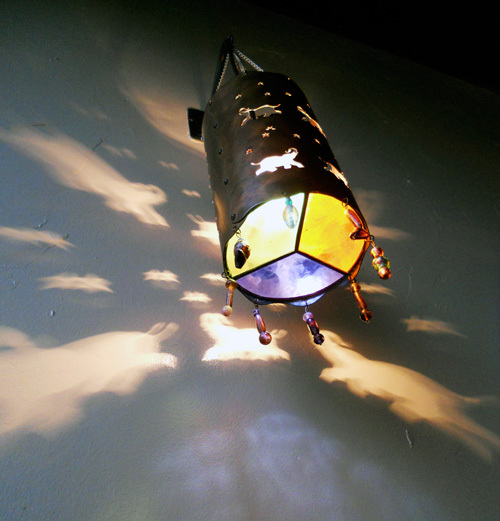 Love the elephant motif continued in the wall lamps, elephants shining on the walls. The table setting with our beverages. GJ had a beer and I had a cocktail called a Dark Army. Yum. Our main dished served with naan and rice. 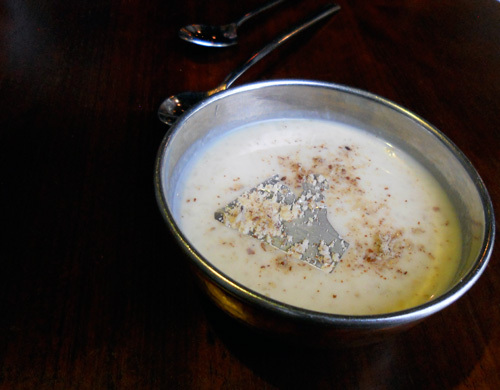 Kheer topped with toasted pistachio nuts and edible silver leaf.